Teddy the Shetland proved a star attraction at the South of England horse trials recently. He was the Riding for Disabled Association’s mascot for the weekend, on loan from Alice Goring. He joined a team of RDA volunteers, which was able to raise much-needed funds for the region, having been selected as the chosen charity for the event- much to the delight of vice-presidents Tina Cook and Pippa Funnell, who were both competing. Some young local fundraisers, sisters Eleanor and Francesca Mumford from Nutley, East Sussex, were thrilled to meet Teddy who was admired by everyone who met him. Teddy is already somewhat of a celebrity with a 42,000 following on Instagram (@teddytheshetland). He certainly helped attract attention and boost raffle ticket sales at the event.In the South East there are 35 groups across Sussex, Surrey and Kent with more than 2,000 riders of all ages. They come to enjoy the experience of riding, carriage driving, show mjumping, dressage, enduurance and western style riding, with opportunities to learn a new skill, enter competitions or even take a holiday. A call has been made for action to be taken against riders whose horses leave piles of dung on pavements and public roads. Following complaints that this is as much a problem as dog mess left on pavements, a UK car hire company has called for a £1,000 fine for horse riders who do not clear up after their equine partners. ValueHire.co.uk has highlighted the growing problem, saying that riders should face the same penalties as dog owner face if they do not clear up after their canines. Spokesperson Susan Jones for ValueHire.co.uk said: “ A substantial amount of our customers are cross about this. Horses can leave an extraordinary amount of mess on the roads compared with a dog, so why should they be exempt from any of the fines dog owners face? “Not only do cars have to drive around or through this mess, but anyone who uses the road could cycle or walk in it too. It is really dangerous. A total of 76 per cent of people surveyed by the car hire company said they thought horse mess should be the responsibility of the owner, and welcomed the idea of fines for those who didn’t clean up after their animals. And she is not alone. A total of 27 per cent of mothers surveyed said they have steered their prams and pushchairs into the road to avoid horse mess on the pavement, while 23 per cent of drivers said they had swerved to avoid horse mess in the past. This means the manure on the roads is not just a smelly inconvenience but also a serious health and safety hazard to drivers and pedestrians and could even be a factor in accidents. ValueHire.co.uk suggests a £1,000 fine per individual fouling offence, which they say would mean either horse riders took measures to clean up their horse mess or they contributed sufficiently to the clean-up by local authorities. It says almost every park or public space has signs warning of the penalties dog owners face if they leave dog mess lying around. And now it is calling for the same punishment to be applied to horse riders too. Cowdray Park’s polo season came to an end with the Finals of the 12 goal Autumn Cup and 6 goal Farewell Cup on September 24, writes Liz Higgins. The Autumn Cup is the last of Cowdray’s six HPA tournaments played annually and there was a good entry of seven teams. Making it through to the Final were Sally Turner’s CPG team and Shane Finemore’s Gardenvale, his 11 goal side receiving a half goal advantage on the scoreboard to start the match. Playing alongside Sally Turner for CPG were 4 goaler Tommy Beresford at number 2, George Meyrick (6 goals) at 3 and Roddy Williams (3 goals) at Back. Lining up for Gardenvale were Jimbo Fewster (1 goal) at 2, Matt Perry (5 goals) at 3, and James Beim (6 goals) at Back with the patron at the front door. Gardenvale took a swift lead with an early 30 yard penalty put through by Perry, soon followed by a 40 yard penalty by England Captain Beim. and the first chukka ended with Finemore’s team leading 3½-1. Gardenvale piled on the pressure in chukka 2 with excellent goals from Perry and Beim taking the score on to 5½-1 before a good piece of play between Tommy Beresford and George Meyrick saw Beresford score for CPG. Perry saved another attempt at goal by Beresford but a foul by Fewster brought a whistle and Beresford scored from a 30 yard penalty, the chukka ending with Gardenvale still ahead at 5½-3. Good end to end polo saw Gardenvale continue their attacking play in chukka 3, but CPG made some excellent clearances before the red shirts of Gardenvale closed ranks and the ball finally went over the line, Fewster responsible for taking their score on to 6½-3. CPG won the ball from the throw in, their attack was impeded and the whistle blew. Beresford sent through the 30 yard penalty shot awarded and the third chukka closed at 6½-4 in Gardenvale’s favour. Chukka 4 brought some pleasing goals. Meyrick and Beresford combined well, cutting Perry out and allowing Beresford to send through a lovely shot for his fourth goal. Beim failed to score from a 60 yard penalty, the ball just going wide. The ball came in from the back line, Beresford tapped it forward, but suddenly Perry swooped onto it and raced forward to shoot a huge long ball accurately through CPG’s goal and Gardenvale moved on to 7½-5. The red shirts won the next throw-in but lost the ball to Beresford, who turned and galloped off to score again. Beim backed the ball away from the throw-in and passed to Fewster, good teamwork ensuring that a well-placed Perry could race away again to score a brilliant goal and secure the final result of 8½-6 for Gardenvale. Lady Beresford presented the Autumn Cup to a delighted Shane Finemore and individual prizes to all players. Matt Perry won the Most Valuable Player award presented by The Polo Magazine and his pony Vasca Irlandase won the Polo Times Best Playing Pony prize. The search is on for three lucky under 18s to win the chance to take a starring role on QIPCO British Champions Day on Saturday October 21 at Ascot. QIPCO British Champions Series, together with The Pony Club, are offering three lucky young racegoers the chance to make the parade ring presentation to the winners of the Balmoral Handicap, the closing race on Britain’s richest raceday on the hallowed turf of Ascot Racecourse. David Redvers, Racing Manager to QIPCO Director Sheikh Fahad Al Thani, said:“We are delighted to offer three lucky winners the opportunity to present the trophies for Europe’s richest Mile handicap, the Balmoral Handicap, on QIPCO British Champions Day 2017. Young racegoers can enter now via the British Champions Series website. Entrants must be 18 years old or younger and do not need to be a member of The Pony Club. The competition closes at midnight on Sunday October 1. Winners will be selected at random and contacted during the week beginning October 2. As well as world-class action on track on the day, there is also a host of activity on offer for under 18s, who can attend the day for free when accompanied by an adult. In partnership with The Pony Club, a specially dedicated ‘Fan Zone’ will include a series of free activities including a bitesize lesson with a jockey coach, a tour of the racecourse prior to racing and a meet and greet with an ex-racehorse. In addition, following the day’s racing, racegoers will also be able to enjoy the official after party which this year is being headlined by award winning British singer-songwriter, George Ezra. To find out more and to book tickets, visit www.britishchampionsday.com. Plumpton’s opening race meeting of the new National Hunt season got off the mark in good style, with the popular Sussex jump track bathed in sunshine and some decent , competitive races on the card. The opening novice hurdle race, covering just under two miles two furlongs, saw jockey Noel Fehily take up the running on 5-4 favourite Vancouver, trained by Neil Mullholland, followed by Dan Skelton’s 2-1 favourite Gibson Park . But Arthington, trained in Wiltshire by Seamus Mullins, owned by Chris Baldwin, was given a patient ride by useful 5lb claimer Kevin Jones, and had a duel downhill to get the better of Gibson Park, ridden by Bridget Andrews, in the final circuit. Arthington at 8-1 went on to make it two out of two over hurdles winning by an easy six lengths. The two-mile handicap hurdle had just five runners and trainer Neil King’s Comanche Chieftain went off with a 12 length lead under Trevor Whelan, aiming to add to his three wins notched up already this season. The runners were well strung out by the bottom bend behind Comanche Chieftain, but 11.4 favourite East Indies, trained by Gary Moore was held up in last place by trainer’s son Jamie Moore, and began to make progress from three out. It was a well-judged ride by Jamie, who made his challenge two from home, taking the lead to win by just under four lengths from Comanche Chieftain with Lord Huntingdon, trained by Alan King, a further 11 lengths back in third. Even more impressive was another assured ride by jockey Noel Fehily on board 11-4 favourite Doitforjoe in the Andrew Jackson Memorial Handicap Chase covering just under three miles two furlongs. He gave this horse a tremendous ride to give Worcestershire trainer David Denis his first winner over fences. Having tracked the leaders to the ninth fence, he came under pressure from three out but Fehily encouraged him along to challenge two out.He kept on over the last to take a narrow lead on the run-in. Jockey Tom Cannon was at his best in the two mile novice hurdle when he partnered three-year-old chestnut gelding City Dreamer, trained by Alan King to an easy eight length victory over Dan Skelton’s The Raven Master. Holly Bush Henry went on to justify being 5-4 favourite in the handicap hurdle over three miles one furlong when he was partnered by jockey James Bowen for trainer Phil Middleton, based in Buckinghamshire. The horse was following up quickly on a winning run at Worcester a few days previously. Jockey David Noonan and trainer Chris Gordon teamed up for victory with six-year-old grey Ramore Will for the horse’s chase debut in the two mile three furlongs handicap chase- and this is one runner which should be winning again soon. Don’t miss one of the best fixtures at Plumpton, which is coming up shortly- half term fun at the annual Moorcroft Racehorse Welfare Centre Charity Raceday on Monday October 23. Kicking off proceedings is the infamous Shetland Pony race followed by seven horse races. Plumpton is delighted to be supporting The Moorcroft Racehorse Welfare CentreCharity again this year. A Silent Auction will be available to all racegoers in the Plumpton Marquee Reception. Hospitality in the Plumpton Marquee is now available. Enjoy early racecourse entry for a champagne reception, three course lunch, afternoon tea, auction and silent auction, as well as rubbing shoulders with racing’s finest, whilst raising money for a worthy cause. Contact Allison Blake at Plumpton Racecourse on 01273 890383 for tickets. Visit www.moorcroftracehorse.org.uk for more information on the racehorse welfare centre charity. Admission tickets for the raceday itself are on sale now. Prices start from £15 for Grandstand and Paddock tickets when booked in advance. Bring children in half term, they go racing free and will receive a free children’s pack and young racegoers badge. The British Horse Society’s (BHS) campaign to reduce colic, in partnership with the University of Nottingham, has received the Veterinary Record Evidence Award. This research found that 90 per cent of horse owners did not feel confident spotting the early signs of colic, and that up to one in five cases of colic seen by vets as an ‘out of hours’ emergency can be critical. The BHS ‘REACT’ campaign is linked to the ‘Vet React’ campaign, which has resources to help veterinary teams identify critical cases of colic as quickly as possible. 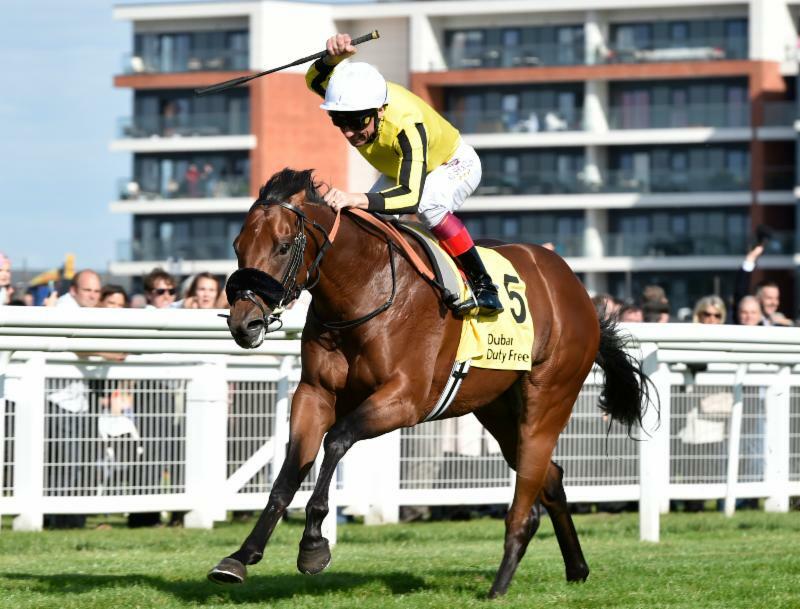 James Garfield provided trainer George Scott with a perfect belated wedding present when breaking the juvenile course record in the £75,000 G2 Dubai Duty Free Mill Reef Stakes at Newbury yesterday (Saturday, September 23). Newmarket-based Scott was recording a breakthrough first Group success just seven days after marrying Polly, daughter of James Garfield’s co-owner Bill Gredley. The Exceed And Excel colt James Garfield, sent off a 100/30 shot after going down by a nose in the G3 Acomb Stakes at York on August 23, ran on strongly under Frankie Dettori to hit the front half a furlong from home and galloped out well to beat 5/2 favourite Invincible Army by three quarters of a length in 1m 10.64s – a new two-year-old record for six furlongs at Newbury. Scott revealed: “It has been the most amazing week and I am very grateful to everyone that has worked hard with the horse at home. It is great when it all comes together. “James Garfield has danced every dance this year and has been unlucky on several occasions. He has shown it over five, six and seven furlongs, and is a pretty versatile horse who has improved physically the whole time. “I think he lost his position a couple of times but Frankie was travelling so well that he was happy to keep the horse in a rhythm and not rush him. He came through the field really nicely and hit the line great. “We will go to the Breeders’ Cup now – the G1 Juvenile Turf (November 3) has always been the race we have been wanting to go to and he will get the tight mile at Del Mar. Caspian Prince is set to contest the £60,000 Group Three Dubai International Airport World Trophy (4pm) over five furlongs at Newbury this Saturday, September 23, ahead of a potential tilt at the $1-million G1 Breeders’ Cup Turf Sprint at Del Mar, USA, in November. Caspian Prince joined North Yorkshire trainer Tony Coyle earlier this year and, at the age of eight, is in the form of his life with a career-best rating of 115, the highest among the 24 entries for Saturday’s race. The five-furlong specialist landed his third Investec Dash Handicap at Epsom Downs in June and defeated G1 Nunthorpe Stakes heroine Marsha by a short-head in the G2 Sapphire Stakes at the Curragh on July 15. His only start since saw him finish fourth to Caravaggio on testing ground in the G2 Flying Five Stakes at the Curragh on September 10. Coyle said today: “Caspian Prince definitely runs at Newbury on Saturday. He is in good order following his run at the Curragh and has not done a lot since. “He does not take a lot to keep him ready. He has been out in the field and will have a couple of canters this week. “It was just a shame the ground went against him at the Curragh, but he still ran a blinder in the circumstances. “We will get Saturday out the way first, but the Breeders’ Cup could be on his agenda as the owner [Stephen Louch] is keen to give it a go. This would be his last run before then because he would have to go into quarantine. The $1-million G1 Breeders’ Cup Turf Sprint at Del Mar, California, USA, takes place over five furlongs on Saturday, November 4. Caspian Prince’s opponents on Saturday could include G1 King’s Stand Stakes fourth Muthmir (William Haggas), G2 Flying Five Stakes second Alphabet (Aidan O’Brien) and Cotai Glory (Charlie Hills), who was a place behind Caspian Prince at the Curragh and had previously finished third in the G1 Nunthorpe Stakes. Atypical Myopathy is a highly fatal muscle disease in horses in the UK and Northern Europe. It occurs in individuals or groups of horses at pasture and has recently been linked to the ingestion of sycamore seeds (also known as ‘helicopters’) and to a lesser extent the sycamore leaves. The toxin has recently been identified as hypoglycin A. The amount of toxin within a seed varies and so we cannot know how many seeds need to be eaten for a horse to suffer from Atypical Myopathy. Some horses are more susceptible than others with younger horses appearing particularly susceptible. It maybe that older horses develop a tolerance over many years. Horses in poor condition or on poor quality pasture are also at risk as they are more likely to ingest the seeds or leaves. Incidences tend to occur in the autumn (October to December) and sometimes the spring outbreaks usually follow a sudden change in weather conditions, such as a frost, heavy rain or high winds. Atypical Myopathy causes a variety of clinical signs including; dullness, lethargy, muscle stiffness, muscle tremors and weakness. Other signs associated with more severe episodes include recumbency, laboured breathing, colic like symptoms and high heart rate. One of the most diagnostic signs is dark brown/red urine. This is because the toxin causes muscle breakdown and those constitutes stain the urine. If it affects the heart and diaphragm it can result in sudden death. Atypical Myopathy carries a poor prognosis with 40-90% of horses not surviving but the key to success is early and fast veterinary care within an equine hospital. Diagnosis is based on clinical signs (especially red/brown urine) and an increase in muscle enzymes (AST/CK). There is no specific treatment only supportive care which involves hospitalisation, intensive intravenous fluid therapy and nursing. IV Fluids are necessary support the horse’s cardiovascular and renal (kidney) systems as horse can quickly become dehydrated and the product of muscle breakdown (myoglobin) can cause renal failure. If there is concern over the kidney function then horses may also be given a diuretic to help the kidneys maintain a good urine output. This condition can be extremely painful and so a variety of painkillers and anti-inflammatories are required. When horses become recumbent the prognosis deteriorates and so we use these painkiller and anti-inflammatories to encourage the horse to stay standing. If a horse does lay down and then struggles to stand again, then the horse will require frequent turning and encouragement to stand. With all of these stresses horses usually lose their appetites and so they need to be tubed with food to maintain their nutrients and energy. Supplementary vitamins and minerals have also been shown to be useful as has Dantrium. In horses that do recover, recovery is initially slow, but most go on to make a complete recovery and return to work with no long-term effects of the disease. Avoid letting horses graze pastures that are contaminated with the sycamore seeds by either grazing different pastures or by stabling the horses during the high risk periods. If you are unable to remove horses from pastures then fence off areas where the seeds and leaves have fallen. Offer supplementary hay but do not leave it on the ground to get wet and feed extra concentrate to fill them up so they are not turned out hungry. Rake up or hoover and remove the seeds, dead leaves and saplings where possible. Reducing the stocking density (the number of horses per field) to ensure enough good grazing for every horse. Restrict grazing to less than 6 hours if possible and check your horse regularly. If you are suspicious that your horse may have ingested some of these seeds then call your vet out to check the muscle enzyme levels (AST/CK) to identify subclinical and pre-clinical cases. If you suspect that your horse is showing any signs of atypical myopathy then contact your vet IMMEDIATELY. If you have any other concerns then do not hesitate to contact your vet for further advice. Hong Kong will for the first time stage three Group 1 features on a single day in Spring, the Hong Kong Jockey Club has announced . The Champions Mile (1600m) and the Chairman’s Sprint Prize (1200m) have been brought forward one week in the calendar, joining the G1 Audemars Piguet Queen Elizabeth II Cup to form an exciting Group 1 triple-header on Sunday, April 29, 2018. “This adjustment to the schedule unifies these three world-class features under the banner of the Audemars Piguet Queen Elizabeth II Cup race meeting, so creating Hong Kong’s own spring festival,” said Mr. Anthony Kelly, Executive Director, Racing Business and Operations. British Jockey Ryan Moore has had enormous success in Hong Kong, where last year he was crowned Longines World’s Best Jockey in Hong Kong. In the same year he also rode Maurice, trained by N Hori, to win the Hong Kong Cup. As previously announced, all three races have received prize money increases. The Audemars Piguet Queen Elizabeth II Cup (2000m) was boosted by HK$4 million to carry a purse of HK$24 million, making it the second-richest race run in Hong Kong. Increases of HK$2 million were applied to both the Champions Mile and Chairman’s Sprint Prize, bringing their total prizes to HK$18 million and HK$16 million, respectively. In addition to these changes, the G3 Queen Mother Memorial Cup (2400m), originally scheduled for April 29, will move back one week to Sunday, May 6. One of only three Hong Kong races run over the distance, all at pattern level, the Queen Mother Memorial Cup is a traditional preparation for the final Group 1 of the season, the Standard Chartered Champions and Chater Cup (2400m), set for May 27 2018.